For all the latest news from Go Kids Go please visit our Facebook page. 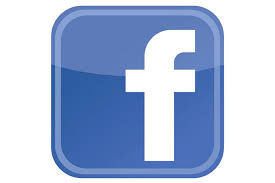 Don't forget to 'Like' our page and please ask your friends to 'Like' our page too. We don't spend much on marketing and promotion pretty much all of our funds goes directly into running our workshops, so please help to spread the word about our work! Just click on the link opposite. Go Kids Go are continuing to run wheelchair/disability awareness workshops in schools. We have been getting some great feedback from both staff and pupils. We do make a charge for our awareness days and we provide the wheelchairs + expert tuition. Get in touch if you know a school that would like a workshop. 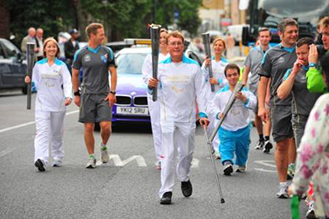 Our founder Owen was nominated by Ade Adepitan to carry the Paralympic Torch. Owen was part of the team that carried the torch through Brent. Ade was one of the first young wheelchair users to come along to our wheelchair skills workshops and Owen encoraged him to take up wheelchair basketball. Maisie and Sam, 2 Go Kids Go champions took part in the 24 hour relay to carry the Paralympic flame from Stoke Mandeville to the Olympic Park on 29th August. We had nominated Maisie and Sam as both of them have been involved with Go Kids Go for many years, attending workshops and raising awareness and funds for Go Kids Go. Well done to both Maisie and Sam. 2 Go Kids Go Champions have been chosen to carry the Paralympic Torch! Congratulations to Maisie McGarvey and Sam Crossley. Sally Hancock, Director, 2012 Partnership at Lloyds Banking Group, says: “The Paralympic Torch Relay provides a unique opportunity to celebrate the people who make a real difference within the disability community and involve them in the London 2012 Paralympic Games. Our [Lloyds TSB/ Bank of Scotland] Torchbearers have truly inspirational stories and as the only Presenting Partner of both the Olympic and Paralympic Torch Relays we’re delighted that we can recognise so many incredible people from so many communities across the UK." Go Kids Go champion Maisie McGarvey is raising money for Go Kids Go by doing a half marathon. Maisie says 'This charity has been my second family for the past seven years. Their motto being "independence through mobility" is exactly what they gave me - independence. That one motto changed me as a person. When I first started out taking workshops and classes with Go Kids Go! I didn't even know where the pushrims were. Seven years later, I am a college student, much more independent and confident. Through the courses that Go Kids Go offer I now view my wheelchair as a tool to help me acheive things. For instance, the half marathon I am hand biking which is set to take place in August 2012. I am doing this half marathon to raise money so that other children can gain the independence that is needed when entering into adult life in a wheelchair. Go Kids Go wheelchair awareness training workshops are held in mainstream schools accross the UK. Take a look at our awareness section for further details and get in touch if your school would like a workshop. As a proud Presenting Partner of the London 2012 Paralympic Torch Relay,Lloyds TSBis bringing the power and excitement of the Paralympic Games closer to you. Lloyds TSB is inviting everyone to nominate someone who has inspired or supported disabled people in their community for a once in a lifetime opportunity - the chance to be a Torchbearer in London 2012 Paralympic Torch Relay. We want you to tell them who should carry the Paralympic Flame in the 24-hour Relay from Stoke Mandeville toLondonin time for the Opening Ceremony of the London 2012 Paralympic Games. It could be the person who has shown courage and determination to push beyond their personal best, the coach who removes barriers and helps disabled pupils participate in sport, the family member who cares for a disabled person or the friend who’s raised thousands of pounds for a disability charity. 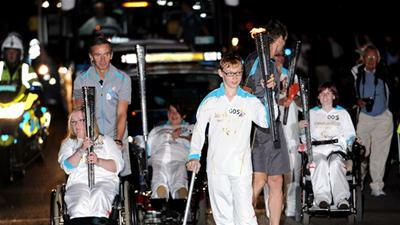 Anyone can be a Paralympic Torchbearer and you can even nominate yourself. A big thanks to Kate Evitts who ran the Lake Vyrnwy Half Marathon in September and raised £678.50 for Go Kids Go! Jasmine Spencer takes on the Berlin marathon for Go Kids Go! We would like to say a big thanks to Jasmine from Go Kids Go! Jasmine complted the Berlin marathon on 25th September with a time of 04:09:33. Jasmine has raised £571.93 for us. Go Kids Go would like to Say a big thank you to Momentum Healthcare for sponsoring our course in Dublin in August. We had a great turnout and all the families enjoyed the 2 day workshops.